The iconic diner was part of the original vision for the site at Paintworks. Ashley Nicholson from Verve Properties included a diner in his original sketches which, rather appropriately, started out on the back of a napkin! Months were spent searching the internet for suitable ideas for the body of the cafe. Plane fuselages, silos and buses were just a few of the options considered. Finally when tracking a converted American school bus, he came across the Airstreams and, like buses, there were not one but three. At that point they were sitting in a field in Pudding Swamp Road, South Carolina, owned by one Billie-Bob Donmar. Until very recently the diner was successfully run by Charlie as 'The Tube Diner' with delicious breakfast and lunch treats, pancakes, smoothies, shakes, freshly made sandwiches, salads and daily specials which were a firm favourite with tenants, occupiers and visitors. 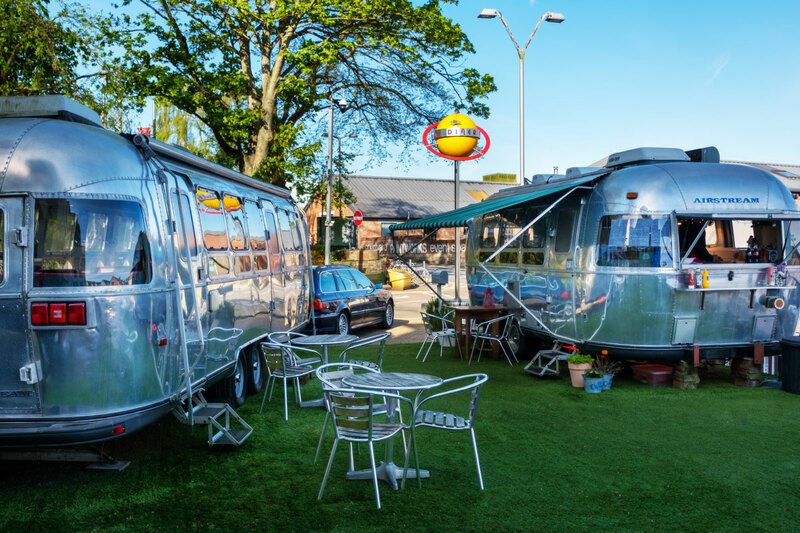 The airstreams re-opened in April 2018 as Convoy Espresso serving spectacularly good barista coffees, teas and infusions, alongside a selection of pastries, toasties, and sweets made with fresh, locally sourced ingredients.